But no media coverage about this event surfaced until after the Chicago Tribune filed a Freedom of Information Act request with the Federal Aviation Administration (FAA) for facts. Jon Hilkevitch reported from his interviews with United employees who spoke only on condition of anonymity. “Like United Airlines, the FAA originally told the Tribune that it had no information on the alleged UFO sighting. But the federal agency quickly reversed its position after the newspaper filed a Freedom of Information Act request. …A United spokeswoman said there is no record of the UFO report. She said United officials do not recall discussion of any such incident. “The pilots of the United plane being directed back from Gate C17 also were notified by United personnel of the sighting, and one of the pilots reportedly opened a windscreen in the cockpit to get a better view of the object estimated to be hovering 1,500 feet above the ground. The object was seen to suddenly accelerate straight up through the solid overcast skies, which the FAA reported had 1,900-foot cloud ceilings at the time. The Chicago O’Hare sighting raises a question about the hole-punch cloud phenomenon reported and photographed occasionally. Are the cloud holes produced by rapidly moving discs from another world? 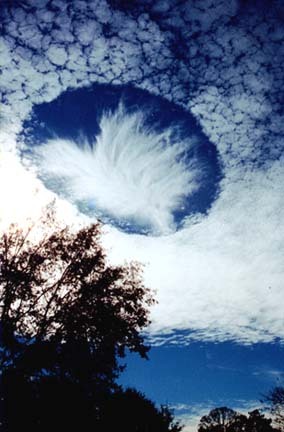 Mysterious cloud holes. Left: Stavely, Alberta, Canada. Middle: Derbyshire, England. Right: Nashville, Tennessee. January 12, 2004, hole punch cloud over Mobile, Alabama. Image © 2004 by Joel Knain. For further information about unidentified aerial discs, please see the Earthfiles Archives below and my books and documentaries in the Earthfiles Shop.